Before there was X-Box or Playstation, kids got to hangout and get their fill of video games at an arcade or pizza parlor. 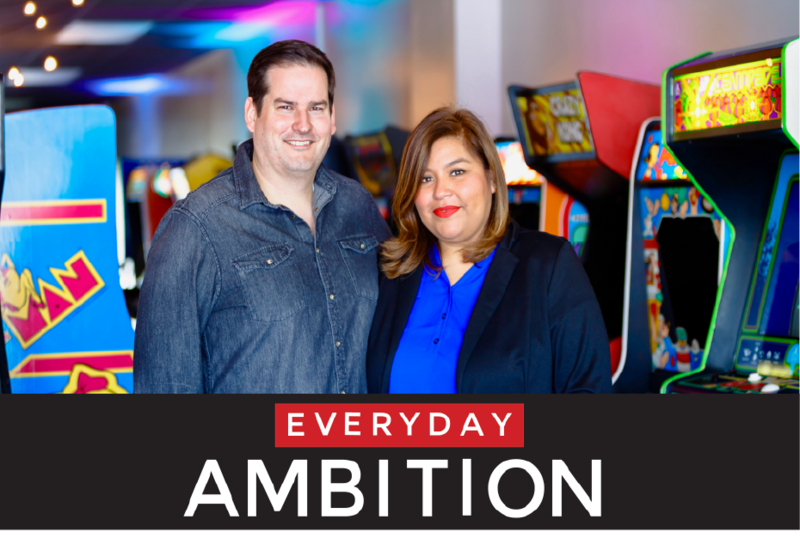 When husband and wife duo, Mark Guenther and Mia Mazadiego, decided to start a business together they leaned into their passion for restoring arcade games and started Neon Retro Arcade, an old-school arcade hangout featuring retro games from back in the day. Their business has grown since it was founded in 2015 in large part to their totally rad social media presence, which caught the attention of Facebook. Mia recently sat down with the Future Yourself Here team to discuss Neon Retro Arcade’s success, the honor of being asked to be a member of Facebook’s U.S. Small Business Council and what the future holds for their thriving business. Mark and I had talked about starting a business together for a really long time but we were hesitant to leave our established careers until we found a business idea that we were equally passionate about. We both had fond memories of hanging out at arcades as kids and even started our romantic relationship over a game pinball in college, so when we realized that his weekend hobby of restoring retro arcade games was something that people of all ages were showing interest in again, we thought it might be cool to take the game collection and put it in a place where the public could enjoy it. In 2015 we took the leap, leased a space, and turned it into Neon Retro Arcade. In just a few years, our small arcade has attracted hundreds of thousands of visitors and in 2018, we opened another location to help us serve the Los Angeles area. Every company grows over time, how has Neon Retro Arcade evolved? We started out as a tiny operation. Mark and I are first-time business owners and we were so worried about overspending that we ran the arcade completely on our own for the first 3 months of operation. Looking back, I have no idea how we did it! Now we have two locations and a team of 13! It’s great to see staff members who have been with us since the beginning grow into full-time positions that are truly essential to our success. What are some of Neon Retro Arcade's accomplishments you’re most proud of? Definitely being able to create jobs and helping other small businesses thrive. Given that we had a miniscule advertising budget and zero marketing experience when we first started out, we really focused on learning how to leverage social media as a low-cost marketing tool. Other businesses noticed and we are regularly asked to consult small businesses on best practices. Additionally, in 2016 Facebook asked us to join their U.S. Small Business Council which created numerous opportunities for us to share our advice with businesses at large events here in Los Angeles and also nationally with features in USA Today, Latina Magazine, and both Facebook & Instagram for Business. What is the biggest hurdle you have faced in launching your company? Finding a property that would lease to us! We searched all over Los Angeles & Pasadena for 6 months before we were able to secure our location. Most people immediately said “no” as soon as they heard the word “arcade”. Luckily, our Pasadena landlord and her real estate agent took the time to hear us out and believed that we could be successful. Start small, grow slowly. You won’t get in over your head if you take baby steps. Also, prioritize a healthy work/life balance – because honestly, what is it all for if there aren’t people in your life to share your successes with? Pasadena is a medium-sized city with a small town feel, and lots of civic pride. Pasadenans really enjoy supporting local businesses and have truly been our most loyal customers and biggest champions! From a business standpoint, there is a fantastic synergy among the fantastic restaurants, retail shops, bars, and attractions like the Rose Bowl that bring in large crowds & tourists. The pedestrian friendly environment, ample parking, and the city’s focus on business development was also hugely attractive. We love Pasadena and are very proud to have found a home for our business here.